How do we know a cat is a cat? And why do we call it a cat? How much of our perception of things is based on cognitive ability, and how much on linguistic resources? Here, in six remarkable essays, Umberto Eco explores in depth questions of reality, perception, and experience. Basing his ideas on common sense, Eco shares a vast wealth of literary and historical knowledge, touching on issues that affect us every day. At once philosophical and amusing, Kant and the Platypus is a tour of the world of our senses, told by a master of knowing what is real and what is not. 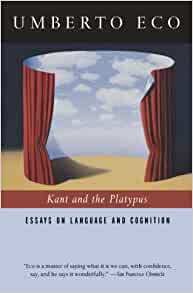 Start reading Kant and the Platypus: Essays on Language and Cognition on your Kindle in under a minute. I'm a fan of Eco's novels, at least a few. I'd never read his non-fiction broadly in the field of linguistic philosophy and especially a sub-field called semiotics; concerning the nature of signs. In this context 'signs' include of course what are in English called signs, and also words which are special. What Eco gets into in these chapters is the connection between the structure of consciousness, the contents of consciousness, and language. This book is a collection of essays exploring the relation between things and signs. The first essay is something of a prequel; not about semiotics, but the nature of "being". It seems to be in the nature of human language that "to be" something is to be discriminated, normally at first by the senses, and then by the application of further layers of the mental. Eco uses this first essay to connect up categories (not Kant's categories) of the mental with mind-independent reality. Eco is a realist. Not only is a mind independent world real, it divides up beginning at the lowest orders of our sensory apparatus. In subsequent essays Eco introduces Cognitive Types (CT), Nuclear Content (NC) and Molar Content (MC), three categories Eco develops to explain how the process of connecting up sign to mind-independent-thing, and then sign-to-sign, occurs. I have to say much of it was a little confusing. Eco's writing here (I assume written originally in Italian) is not always easy to follow. Part of the problem is that I am unfamiliar with the details of this philosophical sub-sub-discipline. Eco's work is scholarly. He makes many references to philosophers in the field (especially Pierce) who are entirely unknown to me. He illustrates his argument throughout the text with two (mostly) examples taken from linguistic history; the discovery and 80 year debate over the nature of the platypus, and the encounter between the Spanish and the Aztecs who until that time had never seen a horse. The examples are pretty clear, but not always what Eco is driving at establishing. It isn't until late in the book in an essay on reference that I found myself on more familiar ground. I suspect that to appreciate what Eco is saying here requires some familiarity with his wider body of work or at least semiotics generally. Still I learned something and it is always interesting to view a field from the viewpoint of one of its masters. I gave up! Missing/misused punctuation, run-on sentences of 100+ words, dangling clauses, Latin phrases and French poetry not translated. Normally a subject enjoy and seek out. It is being deleted. Umberto Eco can be a tough author to follow. But if you want a brain work out and you are interested in semiotics and/or linguistics, this is the book for you! LOVE how to Travel with a Salmon too. That is a more "fun" read! I read the review of Simon Blackburn trashing the book: Eco made a few mistakes concerning the two dogmas of empiricism (he confused Davidson's work with Quine's first dogma). So I am sure many readers hesitated after a review by such a rigorous big gun thinker as Blackburn. When I started reading the book I was taken aback by the combination of depth and the vividness of the style. Eco is sprightly and alive, something that cannot be said of many philosophers dealing with the subject of categories. The notion of categories is not trivial: you need a simple conditional prior to identify an object; it is a simple mathematical fact. You need to know what a table is to see it in the background separated from its surroundings. You need to know what a face is so when it rotates you know it is still the same face. Computers have had a hard time with such pattern recognition. A PRIOR category is a necessity. This was Kant's intuition (the so-called "rationalism"). This is also the field of semiotics as initially conceived. Eco took it to greater levels with his notion of what I would call in scientific language a compression, a "simplifation". This leads to the major problem we face today: what if the act of compressing is arbitrary? Not just very deep but it is a breath of fresh air to see such a philosophical discussion nondull, nondry, alive! Eco's theses rapidly submerge in a sea of florid and neologistic prose. They reappear occasionally like the blowhole of some great whale, more suggesting than revealing the unseen beast below. I frequently wondered whether there _was_ a beast, or if the author was trusting in the dazzle of the waves to distract the reader from an essential hollowness in his creation. The book is nonetheless entertaining for those who enjoy grand displays of erudition. Dont get me wrong, Im generally big on Eco, not only his novels, but also the other essay books and Travels in Hyperreality really was an eye opener in my intellectual development. But Kant and the Platypus was a real disappointment. First, the reference to Kant is rather misleading, for Kant's work is reviewed rather summerally and reduced to an absurdity. Kant's categories of cognition are not geared towards semiotics as such, but towards formal logical operations, the space time structure of thinking. To say that the Kantian categories fall short of an analysis of meaning is to suggest that the faucet was deficient in putting out the fire at Macy's. Second, to say the perceptual categories of every day meaning are negotiated contracts with a community of parlants, does not require almost 400 pages. The essays are like pastries oversaturated with sacharine. After the initial taste or two, u just feel like putting it down. It was a labor to honor the man by finishing the book.